A 37-year-old man has been arrested on an arson charge and is being held on $10 million bail stemming from the King Fire burning in the Sierra foothills, one of the largest wildfires currently burning in California, Cal Fire announced. At a news conference Thursday, Cal Fire Director Ken Pimlott said Wayne Allen Huntsman was taken into custody at the Placerville jail on Wednesday. 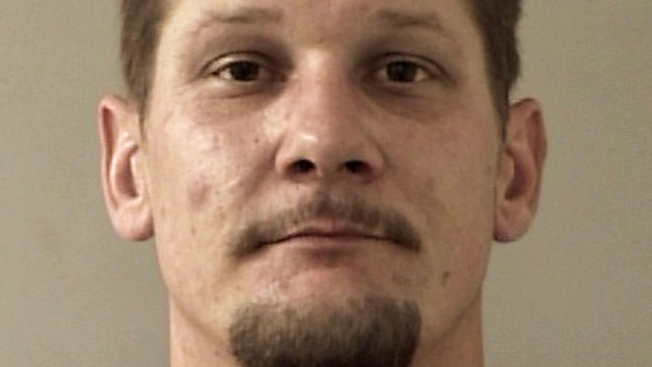 He was formally arrested on one count of arson on forest land where prosecutors accuse him of "willfully and maliciously" setting fire to land around Pollock Pines. Huntsman was also charged with a special aggravating circumstance of injuring a firefighter. Huntsman's last known address was listed in Aptos, about nine miles from Santa Cruz, but when a reporter went there, neighbors said Huntsman hadn't lived there for more than a decade. It was not immediately clear whether Huntsman was being represented by an attorney. No one answered the phone number associated with his last known address. El Dorado County District Attorney Vern Pierson said Huntsman is scheduled to be arraigned on Sept. 19. The complaint shows that Huntsman had been previously convicted of assault with a deadly weapon, grand theft and unlawfully taking or driving a vehicle, stemming back to 1997 in Santa Cruz. Authorities said Huntsman had "no known" arson conviction in his past. Officials, however, would not comment on what evidence led them to suspect Huntsman. But Pierson did say the "ongoing" investigation "started within minutes" after the fire was reported on Saturday. But he wouldn't say more. "I don't mean to be difficult," Pierson told the crowd of reporters. "I don't want to be difficult, but I don't want to comment specifically on anything that's not in the complaint." Huntsman’s sister told the Associated Press she strongly doubts her brother is responsible for starting the blaze. Tami Criswell of Salinas said Thursday that her brother loves the forest and always has been very cautious with campfires. Criswell said her brother works odd jobs in construction and security. She said, if he was involved in the fire, it wasn't intentional. As of the Thursday, King Fire had more than doubled in size overnight, reaching more than 71,000 acres, according to Cal Fire, and was only 5 percent contained. Pollock Pines is part of the Sierra Nevada Mountains and is about 15 miles east of Placerville and 60 miles east of Sacramento. Officials said it was costing $5 million to battle the fire. Gov. Jerry Brown on Wednesday declared a state of emergency for El Dorado County. Slightly more than 2,000 homes, and more than 1,500 other structures were in the dangerous line of fire near Pollock Pines in Northern California, according to the daily Cal Fire update. On Wednesday, 500 homes were threatened. Despite that, no structures have actually burned, unlike in the town of Weed in Siskiyou county, where more than 150 structures, mostly homes and two churches, suffered damage from the Boles Fire there. On Thursday, the fire in Weed, which had burned 375 acres, was 65 percent contained, and Highway 97 had been reopened. The King Fire is burning in steep terrain in the South Fork of the American River Canyon and Silver Creek Canyon, and so far, has caused two injuries. While the largest fire currently blazing in California, it is more than three times smaller than the Rim Fire near Yosemite, which burned about 250,000 acres last August, becoming California's third largest wildfire in history. As a result of the King Fire, a portion of Highway 50 was closed, and many evacuations were in place. A King Fire Facebook page was set up by Cal Fire and the U.S. Forest Service to keep the community alerted with up-to-date information. The page was full of community members offering consolation and help. Yvette Cadeaux offered to take in "goats, dogs or a horse or two down here in Grass Valley for anyone who needs to place their critters." Laura Owens, who wrote in that her husband works for animal control, thanked all the "staff and teams on the fire lines and behind the scenes coordinating the efforts. We appreciate all of you!" As of Thursday, more than 3,600 firefighters were fighting the King Fire. NBC Bay Area's Tim Bollinger and Gonzalo Rojas and NBC affliate KSBW contributed to this report.